Biographical: She was one of four riding in a car driven by her husband, Carl. The car overturned and burned. One other person in the car, Lorraine Davis, age 13, died from burns. Biographical: He purportedly suffered heat exhaustion from sitting in the lane too long while fully suited. Some thought he may have passed out as neither the chute nor the brakes were used to stop the car. 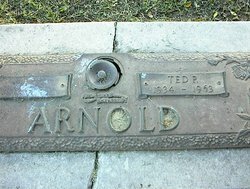 As the car ran under one of the cables anchoring the safety net, the cable clotheslined Arnold's neck, causing him fatal injuries. Some reports say he also smashed into a pole at 180 MPH and/or smashed into a tree. The accident may have been triggered by a blown clutch. 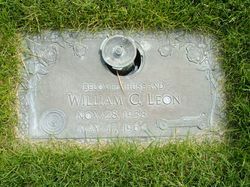 A resident of Arlington, Texas, he was an assembler for General Motors. He was survived by his wife. 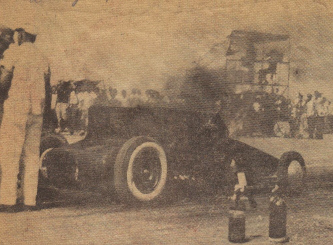 Full Name: Howard Dean Baxter, Jr.
Biographical: His fuel tank exploded as he gunned his engine at the starting line during time trials on the Madera Municipal Airport drag strip. He was waiting for the starter to drop the flag for his second run of the day. He had earlier been timed at 8 seconds and 120 MPH on his first run. Strapped in the car, he was enveloped by flames before the fire could be extinguished. He was from Merced, California, and worked with his father in a boating and liquor store business. The accident was witnessed by about 7,000 people. He was survived by his parents and a younger brother, Ted. Biographical: He died from second and third degree burns he suffered in the 50 MPH crash two and a half weeks before. He was a resident of Covina, California. Biographical: When his vehicle left the race track he crashed into a tree. His brakes were thought to have failed. He died instantly. Biographical: After finishing his run, he applied the brakes too soon, whereupon he ran off the race track and overturned. He was transported to Duke Memorial Hospital in Durham. He died of head injuries the next day. He was a resident of Hampton, Virginia, and was survived by his wife and a son. He owned the Newport News Amusement Company. Full Name: Dennis Peter Cravero, Jr.
Biographical: After losing control after being clocked at 157.985 MPH, his dragster flipped over three times and rolled 900 feet beyond the race track. He was thrown from the vehicle. Car parts were scattered for a radius of 400 feet. He was transported to Lee Memorial Hospital where he died of head and internal injuries. It was thought that his brakes may have failed. He was from Coral Gables, Florida. 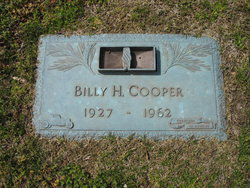 Biographical: He was killed in a drag strip race near Dallas when he lost control of his car at high speed. The car may have been his parent's station wagon. 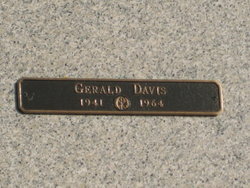 Full Name: Gerald J. Davis, Jr.
Biographical: His parachute failed to deploy at the end of his run and he ran off the end of the race track. He crashed through a fence, sailed over a ditch, and rolled over three times. Biographical: She was one of four riding in a car that crashed. The car overturned and burned. She died the next day from burns suffered in the crash. One other person in the car, Mrs. Carl Alexander, age 17, died. Biographical: When his brakes failed at the end of his run, he ran off the end of the race track and slammed into a tree. He worked as a garage foreman and was attending technical school at the time of his death. 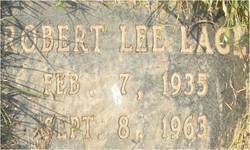 He was from Hyattsville, Maryland, and was survived by his wife, Bonnie, and step-father. Biographical: He was killed when he lost control of his car and it roared off the end of the drag strip and crashed into a tree. He was clocked at 125 MPH. It was believed that his throttle stuck. He was a resident of Templeton, California. 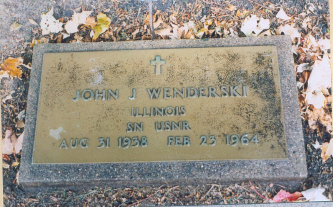 Biographical: He died a few weeks after an exploding flywheel severed a fuel line and caused a fire. 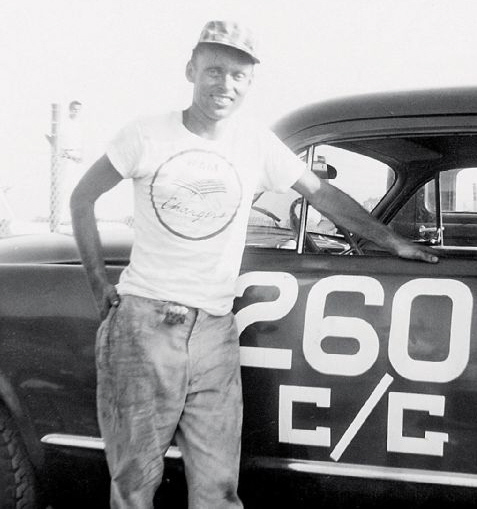 He was a Chrysler engineer and a founding member of the Original Ramchargers drag race club. Biographical: He died after losing control of his vehicle, going off the race track, and plunging into the Chattahoochee River at Shawmut. He was pinned underwater for ten minutes. He was from Birmingham, Alabama. Biographical: He was racing Roy Laufter from Chicago in eliminations. They had finished the run when Hamilton's car started to skid sideways and turned end over end off the race track. He was thrown from the car and part of the frame landed on him, fracturing his skull. He was from Chicago (living at 8336 Kingston Ave.). 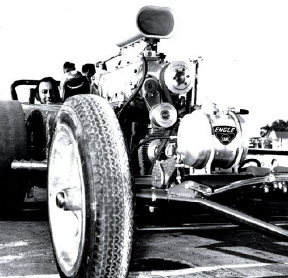 Biographical: He had a very short (six months), but very successful dragster driving career. 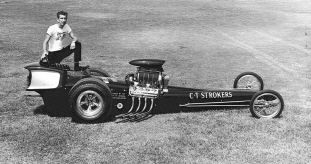 He owned a gas station in Playa del Rey when he teamed up to drive for Ronnie Scrima and Gene Adams in their new dragster. They began putting together a string of straight Top Eliminator wins at Lions Drag Strip that was nothing short of phenomenal. They also took Top Eliminator wins at Pomona and Riverside. They took Top Eliminator at the U.S. Nationals held at Detroit. They returned to Lions and continued their incredible hot winning streak. They were scheduled to have a match race at Lions against Jack Chrisman and his two-engined Twin Bear dragster for a position on the Drag News national ranking list on October 22. Unfortunately one of Chrisman's engines broke so Harris made a pass to run in that night's eliminations. During the run, their engine cracked a cylinder wall so they put their car on the trailer. There was another car that was debuting at the meet that had been rushed and pieced together that week. A couple of other drivers had taken a hand in trying to get that car to make a good pass without success. Harris volunteered to see if he could make a decent run in the car. 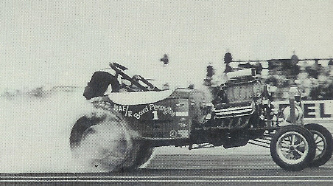 He was paired against Quincy Automotive's twin Chevy dragster. Some were of the opinion that a front axle broke, others that a steering arm had come off, but no one knew for sure what happened. Harris lost control of the car and it made a left turn into the catch fence and got upside down in a violent crash. Harris succumbed to injuries that he sustained in the accident. Biographical: Traveling at over 160 MPH, he lost control of his dragster. It went up a dirt embankment and hurtled 300 feet through the air. Hit hit the ground, bounced in the air again and disintegrated. He died shortly after being taken to Riverside Community Hospital with a fractured skull. He was a resident of Huntington Park, California. Biographical: Two drag race cars collided while making a run. The other car swerved into Kopp's lane and the latter was thrown 59 feet into the air from the impact of the collision. He was transported to Burlington Memorial Hospital where he died two days later. He lived in Beloit, Illinois. Biographical: He was traveling over 100 MPH during time trials when his car veered off the race track and rolled over and over. He lived in Dallas, Texas, and drove for Raymond Austin. Biographical: In only about his third time driving the car, he was going about 125 MPH during qualifying when the car went out of control near the finish line. It got off into the dirt bordering the track, hit some large logs that caused the car to cartwheel and flip before hitting a light pole. That collision with the pole tore the vehicle apart. The chute failed to deploy. He was transported to Salt Lake General Hospital where he was dead on arrival with head injuries and a broken neck. He was survived by his wife, Elvira, and his two sons, Ted and Glenn. He was a line foreman for a power line company and lived in Salt Lake City. Biographical: He had just completed a run before a crowd of 2,000 spectators at 118 MPH when he accidentally pressed the reverse button instead of the neutral gear button. The wheels locked and the car skidded, flipped end over end and rolled sideways. The force of the rotating car caused one end of his seatbelt to be wrenched from the frame. Linderman was then thrown from the car. He was from Bellevue, Alberta, Canada. Biographical: She was driving in the final race for girls and had won the race when she lost control of the car at over 116 MPH. She hit an embankment, rolled over and hit a tree. It was thought that her accelerator stuck. She was dead on arrival at a Puyallup hospital. It was only the second time she had driven the car. She lived in Vancouver, Washington. “Race won; life lost,” Spokane Daily Chronicle, Sep. 6, 1960. Full Name: Herbert John Marx, Jr.
Biographical: His throttle stuck and in trying to slow down, he lost control. The car rolled many times and he was thrown from the car into a cornfield. He died three days after the accident at Good Samaritan Hospital in Cincinnati. He was a resident of Cincinnati, Ohio, and was survived by his wife and son. Biographical: After speeding through the timing lights, he lost control of his car and careened more than 200 yards into a field. He was thrown from his vehicle. He was rushed to a nearby hospital where he died about forty minutes after his arrival. The drag strip was located on an abandoned U.S. army base and 2,000 spectators witnessed the accident. He lived in Westwood, Alabama. Biographical: He was paired up against Ronnie Hampshire in the other lane. When his engine blew up, he lost control and crashed into the safety fence adjoining the race track. He was dead on arrival at Long Beach Memorial Hospital. He was a resident of South San Gabriel, California, and had been diagnosed with leukemia a short time before his fatal accident. 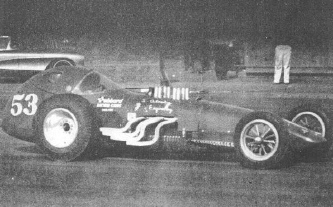 In addition to driving and tuning the Danylo-Pennington dragster, Boyd Pennington drove this A/FR at the Smoker's Fuel and Gas Championships in March 1964 at Bakersfield. He turned 9.35 and 170.11 MPH in the roadster. 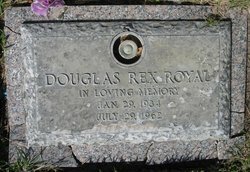 Biographical: Royal, from San Antonio, Texas, died when the car driven by Terrence C. Erven collided with his race car. Erven was going 140 MPH when his car struck Royal's as it was stalled on the race track. Erven, of San Leandro, had to be pulled from his burning car. Erven suffered serious injuries and burns. He was unable to see Royal's car ahead of him because the engine obstructed his view. The flagman accidentally started Erven before Royal was clear of the track. Biographical: After being timed at 187 MPH, his parachute failed to open properly after his run. He tried to slow the car, but hit a rough spot in the road and skidded into a retaining wall at a speed estimated to be 130 MPH. After hitting the wall his car flipped over several times before coming to a halt upside down. He was transported to St. Joseph's Hospital where he was pronounced dead on arrival. 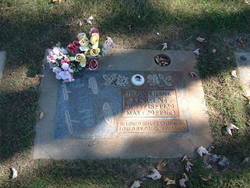 He was a resident of Chicago and was survived by his wife, Helene, and two daughters, Cherylyn and Terese. 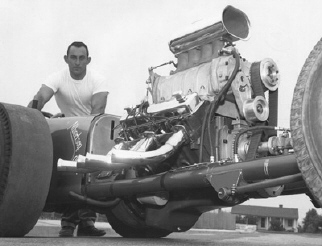 He was a co-owner of the dragster with Larry Reimer of Oak Forest, Illinois. Biographical: He died as a result of a fatal crash at the 1/8-mile drag strip. He lost control of the car near the end of the race track. He was thrown from the car as it overturned, the car rolling over him. He lived in Wilkesboro, North Carolina. Biographical: He was nearing the finish line on the final elimination run when his dragster went off the pavement. Traveling at a speed estimated at 170 MPH, he tried to ease the dragster back onto the track, but the car leaped into the air. It rolled end over end for about 300 feet before coming to a halt. He was pulled from the wreckage and rushed to Washington Township Hospital, but died en route. The push bar on the car penetrated his body and killed him. An electrician, he lived in Hayward, California, and was survived by his wife and two foster children. He had held national records in B/FD and C/FD with his "Top Banana" car which he had run for five years. Biographical: He was 6th in the Drag News national rankings, preparing for a race that was to be held the following week challenging Don Garlits in a best two of three race for the No. 1 ranking at Lions Drag Strip. He was killed during time trials when his car was buffeted by a gust of wind as it approached the finish timing lights at a speed between 160-70 MPH. It began to drift to the left side of the track. It got off onto the side of the race track, hit an embankment, soared twenty feet through the air, and flipped before landing on rocky ground and disintegrating. His body was still strapped in the driver's cage, but lying twenty feet from the bulk of the wreckage. He was dead on arrival at El Cajon Valley Hospital. He was a resident of Northridge, California. 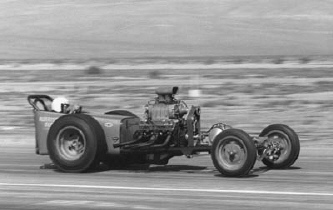 Biographical: Woodcock, from Long Beach, was killed when his car went out of control at a speed of 150 MPH. Soon after launching he began fishtailing and veered off into the dirt on the side of the track 375 feet from the start. He tried to regain control by pushing on the accelerator, but slammed into a light pole near the finish. The car exploded upon impact. He was pronounced dead on arrival at El Monte Medical Center. His best time on the car was 8.28 and 189.46 MPH. 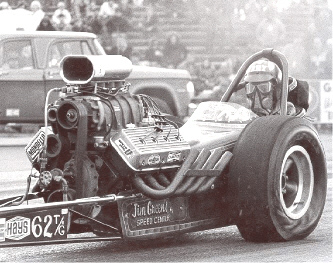 Biographical: His aircraft-engined dragster, owned by Lee Pendleton, was approaching the finish when his vehicle veered into a ditch. It bounced into the air and landed on the race track, became airborne, and soared 200 feet further. It bounced again and finally rolled over into a field. Pieces of the broken vehicle were strewn for a half-mile down the track. He was from Ashtabula, Ohio, and died of head injuries.